am i still tracking down people to follow from TWO follow fridays ago? yes. does this embarrass me? yes. am i going to blame my sudden head-destroying illness? recommended for: People living in a parallel universe. Older teens and adults. Fans of Palahniuk, Ellis, or Woolf. Anyone who likes stream of consciousness, found things, lost things, or genuinely beautiful writing. People looking for the ancestor of 34 Pieces of Me, 13 Reasons Why, Crank, and Scars. 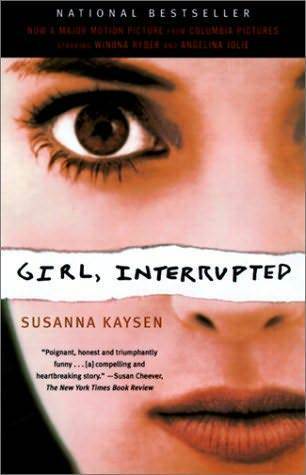 In 1967, after a session with a psychiatrist she'd never seen before, eighteen-year-old Susanna Kaysen was put in a taxi and sent to McLean Hospital. She spent most of the next two years on the ward for teenage girls in a psychiatric hospital as renowned for its famous clientele--Sylvia Plath, Robert Lowell, James Taylor, and Ray Charles--as for its progressive methods of treating those who could afford its sanctuary. Kaysen's memoir encompasses horror and razor-edged perception while providing vivid portraits of her fellow patients and their keepers. It is a brilliant evocation of a "parallel universe" set within the kaleidoscopically shifting landscape of the late sixties. Girl, Interrupted is a clear-sighted, unflinching documnet that gives lasting and specific dimension to our definitions of sane and insane, mental illness and recovery. I swear, someday Thirteen Reasons Why by Jay Asher will stop coming up in reviews. Probably when I stop reading books about mental illness. So, never. Anyhoo. Girl, Interrupted is where all those hard-hitting teen issues books began. It's not necessarily for teens, but older teens especially will find it accessible. Written in out-of-order vignettes about Susanna's day-to-day life in the hospital, and her final release, it breathes the material it seeks to describe. Like the author's mental state at the time, this book is fragmented. It's full of missing time and unconnected pieces. The language is at times chillingly beautiful, at times blunt and raw. I'll admit--I didn't even glance at the author's name when I opened it, so I didn't realize until the end the hugely important autobiographical nature of it. And I liked that. Because it allowed me to read it as a story, and then to re-experience it in a sudden rush as reality. It makes you think a lot about where reality ends and story begins, and it inspired me to write again. I hope it inspires you. If you have a hard time following stories that aren't in chronological order, this one will drive you crazy. Ha. Ha. Okay, I'm sorry, that was terrible. Seriously, though, it confuses and annoys at some points, because it makes it hard to follow a linear narrative. But you enjoy it, because you realize that that's the point. Story isn't linear! Minds aren't linear! Susanna's life is anything but linear. She forms connections in impressions, not in time points that happen one after one. It becomes a sort of diary-like series of random events, a collage of vignettes that ends in one final, beautiful impression. What struck me most was how little was described about treatment, or "being crazy." It was daily life. It was being bored. It was philosophy. It was avoiding nurses. It was the sanity that people don't see because they're focused on the diagnosis. Loved it. It's a brave and wonderful thing to write a book like this. People will revile you for it, or love you, and you can't tell which off the bat. It's also something that somehow feels timeless. It's very embedded in the 60s, but we know it's old-fashioned. We know it's this author's past. Somehow, I don't know how, but somehow it makes it feel like it could exist in any time and any place. The idea of just focusing on hospital years isn't new--Kesey did it, etc.--but the way it's structured with the non-linear narrative makes it a perfect representation of mental illness about mental illness. Form fits function. These are all real people. Even the ones you hear little about feel like fully-fledged humans. You don't get nearly all of their stories, but you feel like you know these girls. They're clever. They're funny. They're irritating and moronic in the most interesting of ways. Susanna herself is often a quiet observer, adding little to the action, but you come to know her through every word. Her voice takes over. I really wanted to know these girls--even the ones who scared me. A painting in words. Seriously. It's not flowery or overly ornate at all. It's just beautiful. Susanna sees the world in such a different way. Her worldview takes over everything she talks about and makes even the most commonplace activities new. I read the last page almost ten times, the last two paragraphs, because they were so perfect. Every word exactly where it needed to be. A collage of images. I could gush about this forever. It was just beautiful. Atmospheric. Dark. Humorous. Amazing. The inclusion of scanned medical documents was a great touch. It makes you realize how differently these papers and the doctors see Susanna's world, compared to how she sees it. A must-read for anyone interested in mental health, or the human condition. A beautiful example of prose. You know, the movie is one of my favorites and I had no idea that it was based on a book. I feel like a sad excuse for a bookworm now. Also, 13 Reasons Why is amazing. I'm glad someone else feels that way. How did I not know this was a book? I have watched the movie probably a hundred times, (no joke, huge Angelina Jolie fan here) and I had no idea it was a book. I need to buy it now.